Contains some spoilers for the ending of Wind Waker. I have recently crossed a milestone with this blog, having successfully kept it going for over a year, and would like to start publishing a lot more review-focused content. However, I will still be writing more reflective posts, such as the following. This week’s post feels a bit lighter to me, but I have just started a new job that has had me working full-time graveyard shifts, so I hope you can bear with me while I simply share some experience I’ve had in gaming lately. I find that gaming for me has been particularly Zelda series focused as of late. The releases of Hyrule Warriors and Majora’s Mask 3D have pushed me to finish games I was still in the middle of, such as A Link Between Worlds and Wind Waker HD. As a result, this has got me thinking a lot about the Zelda games as an interconnected series. 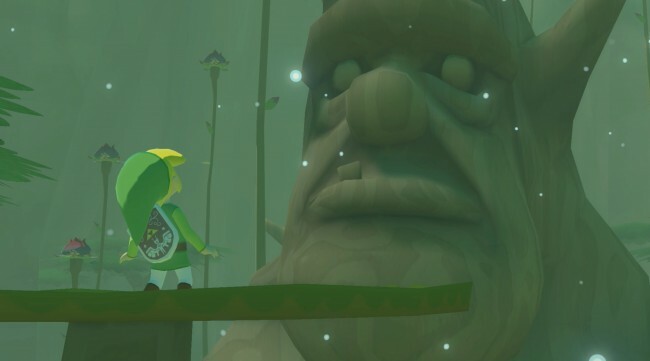 Particularly, it got me thinking about Wind Waker HD. 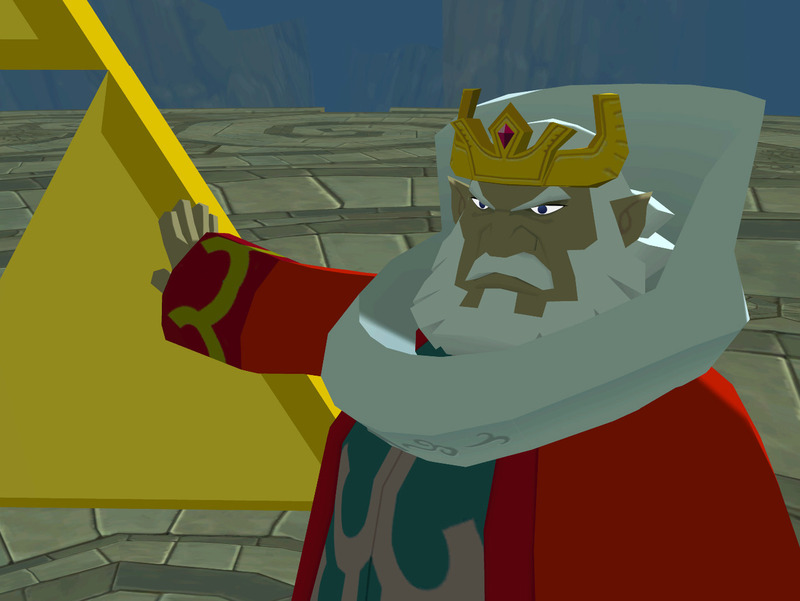 Of all the games in the series, Wind Waker was one that married itself very firmly to the lore of a previous entry, while presenting an entirely new world. The dramatically different art style aside, the game has everything do with the fact that Ocarina of Time took place before it. This resulted in a slew of references, appearances from old characters who have survived the ages, and other remnants of the forgotten age of the Hero of Time. 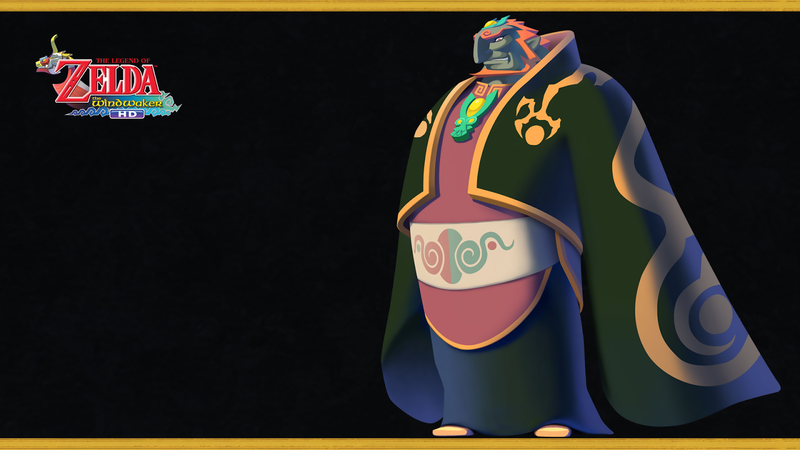 What stuck out significantly to me while playing Wind Waker HD — which I couldn’t appreciate as much back in 2002 when it first came out — was how much the game did to flesh out Ganondorf as a character. The main quest is not at all unlike a typical Zelda game — becoming equipped and able to save the land from a powerful tyrant monster man — but the story and reasoning behind the whole quest is a lot deeper than that sounds. Ganondorf isn’t exactly trying to take over the world. The world he wants is gone, drowned and sealed away by the ocean that is the game’s world. What he wants is to obtain the Triforce once again in order to restore Hyrule to its former glory. While we understand that this would only lead to a rein of tyranny once again, his objective is not entirely evil. He is acting out of desperation, much like any remnant of a lost world would, consumed by a desire to get back to a place he can call home. One thing that stuck out to me in particular happened during the final confrontation. 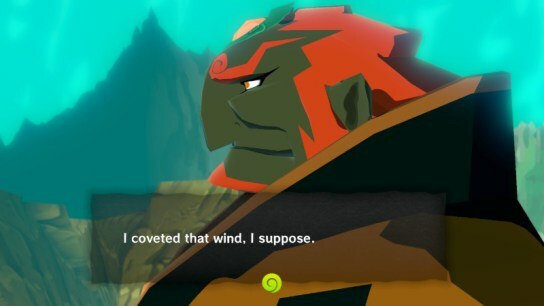 Ganondorf talks about the desert he grew up in, and how he coveted the land of Hyrule because of its lush prosperity compared to the harsh wastes of his homeland. While still the villain, it is an interesting moment of self-reflection, where he displays a relatable motivation for his actions. I found him more sympathetic in this game than he ever has been before or since. His ultimate defeat is not just at the hands of Link, who slays him, but the King of Hyrule, who wishes instead that Hyrule be destroyed permanently in exchange for a meaningful future for Link and Tetra. This drives Ganondorf seemingly mad, when just moments before he made a point of telling Link he wasn’t going to kill him. His last hope gone, he is driven into a frenzy and the final battle begins. It’s a small thing, but something that made replaying the game more meaningful nonetheless. It showed that the game was really about moving on, in a lot of ways, rather than dwelling on the past, like Ganondorf did. This is what the King of Hyrule learns ultimately, him being in many ways the other side of the same coin as our villain. Instead of trying to dredge up the past, which is long since washed away, he focuses on helping to build a new and better future.